The Sharp-aX Works Order & Bill of Materials Module is designed to cater for businesses who manufacture, assemble or transform products on or off site. 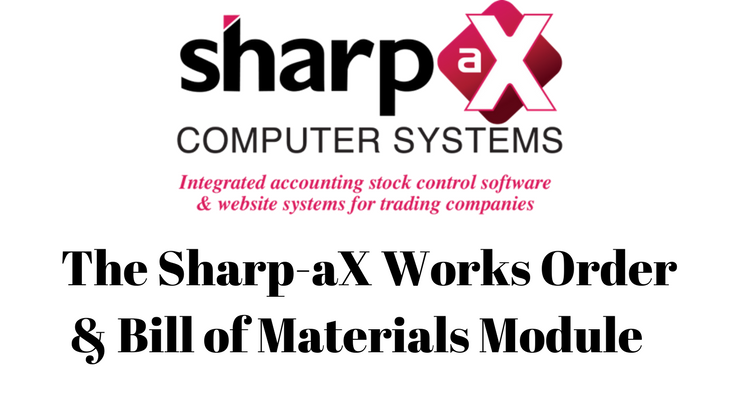 Sharp-aX Works Order and Bill of Material Module offers a tailored solution to streamline stock control and make working through processes simple and straight forward. The Module enables quick identification of the components in stock and how many bill of materials items could be built. How many items are in build process? How many are completed? How many and which items are required to fulfil sales orders? The Module incorporates labour costs to the cost of the Bill of Materials items. Subassembly items and multi-stage works orders allow users to create the most complex multi-level bill of material items and record every step of the manufacturing process. Labour requirements are added to each works order stage. Stock is only moved when it is required and the user will always know how far along the manufacturing process the bill of material item is without leaving their desk. Create works orders from sales orders with one click. Once manufactured the goods will be automatically allocated to the sales order ensuring swift and efficient fulfilment of customer orders.